Privacy, security, freedom of expressions, harassment, etc. are words that have not only changed in their meanings but also the related contexts. Today, we’re more concerned with our online presence then the insecurities of the physical world; thanks to the continual erosion of online privacy and an alarming number of security threats. In such a case, VPN is your only savior; don’t know what a VPN technology is? Worry not! This VPN beginners guide will make you a VPN pro. If you have a handful of tech in your reach, including VPN and antivirus, you’re virtually healthy and wealthy (close to absolute anonymity and highest possible protection). We, at ReviewsDir always create avenues for our readers in elucidating their digital lives, offering them maximum exposure at the cost of minimum inconvenience. 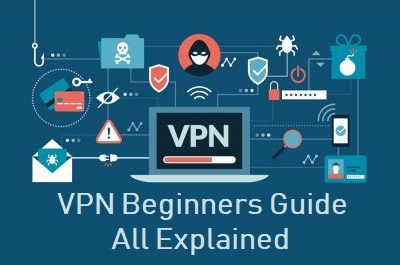 So, get ready to know what a VPN can do for you, why you should use them, how it all works, and which one is best for you, in what situation a VPN could be used; in short, everything about the Virtual Private Network. First thing first, let’s get to know the technology. What Is A VPN? Unveiling the Technology Behind! How VPN Works? How Do I Start Using a VPN? Who Is Interested In Our Online Data? Mass Surveillance – Don’t Stop, Just Avoid Them! Sports Streaming – You Name It, VPN will Let You Have It. Public WiFi Hotspot – A Nightmare You’ll Never Forget! Logging Policy – No should be NO! 2. Is VPN Totally Safe & Secure? Some Green Flags! 3. Does a VPN Slow Down Internet Speed? 6. Is VPN same as Proxy? 7. What is The Future of VPNs? Is it Bright or Right? 8. Is there any disadvantage/s of using a VPN? Virtual – Anything with a digital presence. Private – Not for everyone. Network – A collection of two or more people, nodes, servers, people, office, systems, and anything; name it and connect it. Let’s put them back – Virtual Private Network is a digital network of servers, dedicating one user not for everyone. If you think this definition is enough, and you don’t need any further details about it; then we’ve treat for you! I mean if you are looking for a best VPN, you’ve landed at the right place. We will tell you our secret formula for finding the best VPN later in this article, but if you want to grab one the best VPN provider for your digital anonymity, then click here. We’re sure our experts won’t let you down; your all privacy, streaming, and security needs would be fulfilled by all of the VPNs you will find in our mentioned reviews. Anyways, let’s get back to VPN-VPN thing! Technology runs on multiple yet complex hardware and software, but you don’t worry! We won’t be discussing that aspect; I will try to be more generic, using common senses. Let’s take a look at how VPN works diagram closely. You open the browser and start typing “The Umbrella Academy” your internet traffic directly routed to the host, revealing your identity; in this case, if you’re not in a Netflix-friendly region, you’ll be blacked-out. Now, change the picture, let’s suppose you’re under a VPN protection that enabled you a nobody in the digital world and connected with a VPN server in the US; now try the same thing and believe me you’ll be connected, no matter wherever you are. This is the magic that only the best VPNs like ExpressVPN, is capable to do; masking your real IP with that of VPN, which is full of unbreakable codes that prevent unauthorized access. Nobody could decipher if tries to intercept. VPNize your traffic with one of the best ones with DNS resolution system and anonymize your digital footprints; let the VPN deal with such creepy behavior of internet. Confusion cleared? But why and who is interested in our data? A tricky question, let me tell you some of the top beneficiaries. It’s not just a cup of tea for hackers, and malicious app developers, large corporations, like data-mining companies keep and then sell our data to third-parties and advertisers, without our consent. Not only this, even countries (those of 14 eye surveillance and others) have laws, that encourage authorities to log netizens’ moves; if you’re not aware, then be patient! We will cover all these in details. Sometimes, even the VPN companies log users’ data and hand it over to strange hands; so make sure the VPN, you’re trusting must be logless. Whatever it is, use a VPN and get your online world under control; get it now in your data-loaded PDAs, following the given steps. Using a VPN is way easier than one can think of; even kids can use it without any parental guidance. Almost all the commercial VPNs follow a straightforward process. Launch the app and get connected with your respective geographical server, or let the provider connect you to the closest and/or limited-traffic route. Manual setups are quite obsolete, but in case you’re an old school and want manual configuration, then the support page of respective VPN will guide you briefly. Don’t worry! All your favorite screens are compatible to VPN technology; it’s just like any other app that is easily available across all the major app stores. Takeaway: Not all the VPNs offer diversified compatibility, it varies VPN to VPN; get to know them before downloading a VPN. Since one of the reasons of a VPN – to avoid being under constant threat and surveillance – have already mentioned, there’re more than just this; so, let’s give all of them a shot, what say? But wait, first talk about some shocking facts for not being VPNized. It’s the first quarter of 2019, while the companies like Marriott (compromised the data of 500 million guests), Apollo (lost database of billions of data points), Quora (risked personal information of some 100 million users), and so many others, are still in the shocks, while the new year’s data breach calendar has begun; hackers don’t go on vacations. Find out all the latest data breaches. We’re sure, you won’t spare a second, and get yourself VPN-protected right away. Now, let’s move on to all the real-time benefits and the reasons, that would convince you in the right manner. VPN was established by Microsoft back in the ’90s for employees to connect to the office with a secure connection remotely; thanks to its faster ability that led to widespread business adoption. The VPN usage has gone far beyond just business. Before talking about the level of surveillance we all are exposed to, let me puzzle you with some basic questions. Have you heard of NSA Prism Program of USA, Great Firewall of China, data retention directive of EU, GCHQ in the UK, Bill 67 of Australia, SORM, XKeyscore of Sweden, and so many other strange laws that are prevailing in the cyber world? Hold on! We’ve already chased the surveillance our law and orders are prevailing, but what about the winners of hell hall of shame; I am talking about all big giants – Google, Sony, Amazon, Facebook, and Microsoft – that we all are bluntly using almost every day, every hour or maybe every minute. These high-profile corporations are collecting our digital moves for repurposing and other indecent reasons; thanks to the internet for surfacing some of the scandalous stories with us. Facebook and Cambridge Analytica is one of the widely-known ones. Cyber threats are everywhere, the only way to avoid such threats is anonymity; once you’re nobody, you can’t be traced or trapped. The best anonymity is only possible with the best VPN, so don’t overthink and anchor your anonymity to a VPN and be invisible for prying eyes. Be it MMA, Basketball, Football, Cricket, or any other international sports, a plethora of live streaming channels exist to stream, but unfortunately, these channels are not within everyone’s reach. Thanks to geo-restrictions for not letting everyone access the broadcast content; you have to be in the UFC-friendly regions or simply in the US to enjoy online streaming. No more growing stress, connect to a VPN and get a virtual visa to travel anywhere in the cyber world, and enjoy everything which is not accessible within your home region. Keep one thing in mind – A VPN spoof your virtual location, but not forgo cable subscription; if any channel is paid, then you’ve to register yourself before accessing the channel. Public WiFis are simple, easier and safer playgrounds for hackers to practice their playful skills; so it’s all up to you, whether you want your data to be in strange hands or to be protected. Avoid becoming the victim of WiFi scams by protecting your internet connection with a VPN; find the best one from the given list. The internet has been entertaining us for years, but not now; the world has been badly infected with the germs called ‘Regional Discrimination’, so does the virtual content; if you’re not living in the US, the Netflix US library is far from your reach, only a Netflix-friendly VPN can do some wonders. It’s not the case only with Netflix, Hulu, HBO Go, Amazon, Foxtel, BBC iPlayer, and many others are also get affected. 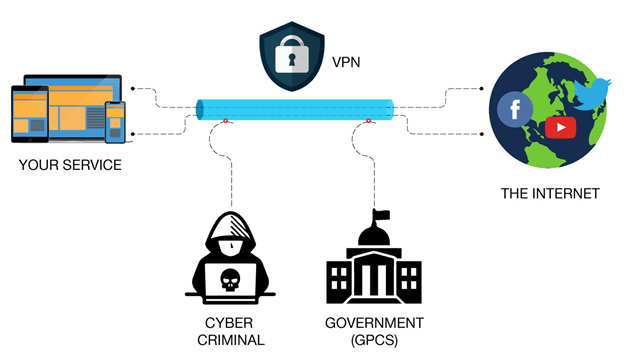 Forget being discriminated with one-shot solution – VPN; a VPN can turn you a US citizen for ISPs, or be it anywhere to get connected. Let me tell you a secret, that I come across while discussing the VPN with one of our experts; do you know, airfares vary between regions, more in one country, less in others. So, what you’re thinking, must be the same as I am! Go get the VPN from our list of best VPNs and get connected to find the lowest rates for your next vacation. What say? Not a bad idea, isn’t it? Not only airfares, even hotel bookings, and other related expenses could also be saved from connecting to a server of a country with a reduced purchasing parity; what else you want with as VPN? The ever-evolving gaming industry has taken out from Mario games to MultiPlayer online games; but not for everyone. Yes, there are many online games that are restricted to specific regions only; lags and latency in MMORPG games is another debate. Here once again, VPN comes into contact, but not all VPNs can settle your gaming craze; find the VPN with optimized gaming servers to achieve the goal. Another widespread use for VPNs is torrenting and P2P downloads; we ‘re sure you guys must have remembered Joel Tenenbaum, a student from Boston University who caught up for illegally downloading and distributing music in a copyright violation, but worry not! A torrenting VPN truly hide your IP address and turn you invisible from third parties. Let me tell you one thing, P2P is not illegal but the technology is being used for illegal downloads, that’s why we’ve been witnessing strict actions like; Boy Genius Report weblog of EU, International Federation of the Phonographic Industry of Canada, AFACT of Australia, Digital Economy Act 2017 of the US, and many others. If you torrent anything under such strict jurisdiction, then copyright holders swarm and collect your connection data including IP along with connection times. Resultantly, you’ll be fined or sued for infringement on behalf of them. Note: We, ReviewsDir do not support copyright infringement, torrenting without a VPN is like dining with the devil – even if you are downloading a single clip. A VPN lets you use VoIP apps; you can use Whatsapp and other blocked apps in UAE. Use a VPN for SEO optimization and online marketing; access global forums and communities and boost your websites. And, yes, how we forget remote access, something that a VPN has initially established for; VPN has still been using for remotely accessing office network. Isn’t more than enough, I mean one technology, and more than ten uses. But hold on! Not every VPN in the market is actually performing flawlessly; both best and worst exist. Want to test a VPN, following the experts’ measuring scale? Have a look! It takes almost half a month for our experts to review a VPN, so if you’ve time, so go ahead with these measuring criteria, or better to go with our experts; our updated list of fastest VPN will help you a lot. To make your VPN selection more relaxed, I am dividing the factors into very important and less important ones, supported with the perfect benchmarks. First, let me clear your basics. In brief, encryption starts with the plain data, apply a key (secret code) to transform the data into an encrypted form, that only the destination website can be decrypted with the original key. This is the modern encryption algorithm principle; the second step is quite complex and worthy of doctoral- level research. Buying guidelines you need to look for is the AES algorithm being followed by a VPN provider; accept the one with at least 128 bits or more. All the top VPNs go a step above offering AES-256 encryption, including NordVPN, and ExpressVPN – all have been reviewed by our experts and have secured top positions in our list of best anonymous VPNs. PPTP (Point-To-Point Tunneling Protocol). This is the oldest protocols, designed by Microsoft. It’s a part of the Windows operating system. Avoid if a provider is offering the only protocol. SSTP (Secure Socket Tunneling Protocol): This is another Microsoft kid, established with some SSL/TLS encryption (standard encryption for web). SSL and TLS’s strength is based on symmetric-key cryptography; only the two parties involved in the transfer can decode the data within. Overall, SSTP is a secured solution. L2TP/IPsec (Layer 2 Tunneling Protocol): This is a combination of Cisco’s L2F and PPTP protocol. The concept behind this protocol is simple — it uses keys to secure connection on both ends of your data tunnel — don’t forget! the execution isn’t entirely safe, adding the IPsec protocol could improve security a bit. There are reports of NSA of breaking this protocol; no matter if those are true, but the presence of such debates is enough to avoid this as well. IKEv2 (Internet Key Exchange, Version 2): This is yet another Microsoft-built, an iteration of Microsoft’s previous protocols and is relatively more secure. It provides some of the best security. OpenVPN: This is what’s considered the best among all the above protocols and also does away with so many flaws. It’s an open source project and based on SSL/TLS; developers are continually improving it by securing the connection by keys that are known only between you and the website. This is known to be the most versatile and secure protocol. Generally speaking, all the top-most VPNs allow you to opt the protocol you like to use; more secure protocol you select (OpenVPN, IKEv2), the more secure your session will be. Unfortunately, not all your devices will allow using all these protocols; Microsoft ones will be able to use on all Windows PCs and for Apple generations, some limitations awaits, L2TP/IPsec is the default protocol for iOS. Many VPN providers attract privacy-conscious netizens by claiming to be the logless or zero-logs policy; frankly speaking, it’s technically not possible to be entirely logless for a VPN provider to operate. Such logs make you a bit less anonymous since your IP can be connected to a browsing session that you already had. Of course, tying this to you is difficult but still, be doable if some agency asks. Overall, the fewer logs your provider keeps is the ideal. We’ve already researched for you; find our list of VPNs with close to zero-logs policy, don’t forget to check it out. There are some less important but essential for added security features that stands out a VPN provider among the entire lot; find the one which has most of these. Purchasing a VPN service? If yes, then find these features. Kill Switch – An option that protects your internet, even when the VPN connection drops. Split Tunneling – Choose your traffic to route via VPN or keep some of them unprotected, without affecting speed for other activities. VPN Apps – Convenience is something we all are fighting for; a VPN with easy-to-use apps are more considerable than the ones that encourage manual configuration. DDoS Attack Protection – The last attack on GITHUB is not an old story to tell; though this option is available in business and/or game-friendly VPN or to protect gamers and firms against such disasters. IP Leak Protection – Usually implemented at the server end, VPN providers protect users from leaking their original IP. Double VPN – Only a handful of VPNs offer this option to enjoy \higher security, protecting the connection with 2 VPN servers. Payment Methods – More the anonymous, the better the service provider. Availability of bitcoin or any other anonymous payment method/s, stands out the provider in the pond. Sometimes money-back guarantee and/or a free trial could also possibly change your preferences. VPN over Onion – It’s an added privacy-driven feature with so many layers of security just like an onion. If the service provider features a VPN with Onion router (tor), don’t miss it. WebRTC – Web Real-Time Communication, a mechanism that mostly uses in web voice, video, or file sharing; all these require your IP, mask it with a VPN. This feature protects IP-leak incidents, offered by VPN services. Sounds too much technical? I can sense that! What if I share some of the red flags to look for? If you find any two of them, don’t grab it. Bandwidth limitations that include throttling speeds for specific types of traffic. Data caps, a limit is placed on how much data to be used in a billing cycle. Limited or no customer support or contact method to reach the provider. Presence of ads or popups. Server limitations – many VPN providers don’t offer a lot of servers and some times, it won’t let you choose different servers to connect through. Anyways, no more tech-geekiness, let’s clear some of your primary concerns and queries surfacing in the context of a VPN. The most haunting question, is using a VPN legal? First of all, VPN is a technology like any other; the concept got the limelight in “legal years,” so not all jurisdictions have managed. Confused? This means that such rules are dark and gloomy and one can be interpreted in some ways. But wait! VPNs are not okay in Turkey, China, Iraq, UAE, Belarus, Iran, Oman, Russia, North Korea, and Turkmenistan; again here’s the catch, you can use a VPN headquartered anywhere other than these regions. If you want to check the legality of VPN in your country, google the laws of your local government. Although a VPN is the safest way to protect your anonymity and privacy and keep your data encrypted, but this savior should also be safer enough to anchor our privacy to. Keep an eye for these things before subscribing to a VPN service. Encryption – as we’ve already mentioned; the best VPN service uses AES 256-bit encryption; this encryption is used to secure government and military data. Shared IP addresses – A shared IP for multiple users, making it impossible to pinpoint traffic to a single user; go with a VPN with shared IP address. Logging – Only go with a VPN that offers a no-logging policy or be sure with their logging policy. IP leaks – If possible, run a trial of the VPN service before giving a final call. Once connected, test its IPLeak; if it shows your or your ISP location, don’t fall for it. If checked all, go for it! Yes, but not by too much. But why? Here’s an answer. Since our online traffic travels an extra leg, encrypting and decrypting your data, put more stress on processing power – therefore takes time. Another possible cause could be the distance of your home country to the region you’re trying to connect; far the VPN server location, more time your data take to reach the destination website. The average out of a handful of popular VPNs is between $4 – $5 a month; VPNs that cost more than $10 are not typical, and frankly speaking, there is very less number of reasons to buy them. Tight on a budget? Most of the services give out big discounts on their longer-period packages – one or two years. You must be thinking to opt for any free service, I would recommend you don’t go with the free providers; they are somehow scams, log profiles and sell them to third parties. Don’t forget how PureVPN shared the data of Ryan S. Lin, 24, of Newton, Massachusetts to FBI. But still, for your better understanding, I am sharing you something regarding paid vs. free VPNs, so that you can take decisions easily. The hardest decision when opting a VPN is – whether to go for a free VPN or a paid one; these noticeable differences will help you a lot. Firstly, VPNs need money to operate; if you’re not paying, then someone else is paying for your VPNization; guess who? The best way is to go for paid ones, especially those who offer a free 7 to 30-day trial or a money-back guarantee so that you can test the services before committing to their subscription plan. Subscription-based VPN providers take performance, privacy, and our security a lot more seriously, and thank God, they rarely show ads which is no less than a spoiler. Whether you choose a paid or free VPN, make sure you’re doing your research properly before signing up. We, at ReviewsDir.com have a dedicated VPN reviewing team and when I discussed them in our last panel discussion, believe me, I didn’t find any reason not to use a VPN; rather come to know some of the other than the run-of-the-mill benefits; allow me to share. VPN is a security layer over SSL protocols on the website we visit, and it is incredibly useful. With a VPN, you won’t be needing to worry about shady software and scammers; you can share as much content as you want on social media, and so on. Being the only downside that – slow down the connection sometimes – VPN industry is proliferating and is expanding the usage among netizens and businesses. Since your data is routing through an extra server, speed possibly reduces. No, not really, a proxy is an ‘intermediary’ between the computer and the internet connection; once connected, the computer connects to the proxy, and then to the internet, your internet comes from the proxy. Whereas, a VPN creates an entire private network for you, maintaining effective security and privacy than a proxy server. The proxy does not follow the concept of the VPN tunnel; the chances of exposing the data to potential prying eyes gets easier. In the wake of the inherent insecurity of public Wifi and other security breaching techniques, VPN is a better option to go with. The future of VPNs is bright – but not for the right reasons. From corporate tracking, mass surveillance, to online censorship; pushing the VPN usage higher, but we can’t ignore the increasing blockage of various websites by western governments – from adult to torrenting sites. Mass surveillance is continuously unabating in much of the cyber world. United States: Internet providers are legally recording browsing histories and selling the information to advertisers – or can exchange with government surveillance agencies. United Kingdom: One of the worst countries for privacy, follows a similar pattern of surveillance – recording browsing history, location data, and even text messages, of users. This data is then handed over to UK government agencies without any warrant. Australia: Australia also implemented a mandatory data retention policy requiring telecoms to collect calls, internet connection data, and text messages. Being without a VPN means leaving your digital footprints open to legal and illegal hackers to intervene and use them for any intended purpose; the risks of data collection, mass surveillance, and security threats, will continue the expansion of the VPN and its legit usage – perhaps it will become the mainstream. Although using a VPN makes our online sessions safer if the provider is perfectly living by its claims. But there’s always the bad side of everything, so does the VPN, no matter the chosen VPN is the best on the market; no VPN comes without some disadvantages. Freemium VPNs are Rare – The cut-throat competition is letting premium providers to be into a paid zone; there are free VPN downloads, trying a free 30-day VPN trial is preferable. VPN Usage is Tricky – If you don’t know the technical know-how, you have to trust all the tricky practices of a VPN; if you find any problems, refer their customer service. VPN Regulations are Keep Changing – Countries like Iran and China are cracking down on the VPN use, so keep up-to-date on VPN laws and regulations of the country you’re living. Your VPN has an EYE over your shoulders – Using a VPN means routing online activity through your VPN provider; here again there’s a catch – if your VPN provider is committed to protecting your privacy, then you can trust. Data loss – Signing up a low-quality VPN might encounter data loss and weak performance; issues outside of the private network is mostly beyond the control of VPN providers. Between mass snooping to hackers and fraudsters, keeping digital footprints hidden becoming a norm rather than a consideration; especially using public networks – GSM or LTE band – so be smart for smart scammers. If you’re developing your security toolkit and want a one-for-all solution, then it’s highly recommended to consider adding a VPN to it; or to get ready for your data to be breached in future data breaches. Be safe and have no regrets, only with a VPN.